Miranda – at least the core rule that statements made by suspects in response to custodial interrogation are admissible in the prosecution’s case-in-chief only following a knowing and voluntary waiver of the Miranda rights – has survived decades of attack. However, since the Supreme Court decided this seminal case, little attention has been focused on whether Miranda went far enough? If, as the Miranda Court emphasized, the purpose of Miranda warnings was to ensure criminal suspects were provided a meaningful opportunity to exercise their privilege against self-incrimination, why has Miranda never debilitated law enforcement in the ways predicted when the decision was handed down? Three apparent answers emerge. First (as Justice Scalia periodically asserts), perhaps waiver and confession by a criminal suspect is a natural, logical, and laudable action motivated by contrition and the desire to accept responsibility for criminal wrongdoing – a natural product of human catharsis. This conclusion is suspect. If true, the interrogation techniques on which police routinely rely to obtain confessions (albeit after a valid Miranda waiver) would generally be unnecessary; suspects would be inclined to confess of their own immediate volition. Second, perhaps the whittling away of the breadth of the Miranda decision by subsequent jurisprudence has rendered Miranda a practical nullity? This explanation is equally unlikely considering most confessions are obtained in the traditional custodial interrogation environment where compliance with Miranda remains a requirement for admissibility of these confessions. Third, perhaps the Miranda warnings never truly achieved their intended objective: to restore confidence that a suspect’s decision to cooperate during a police interrogation is the product of his own decision and not governmental coercion. If the purpose of the warnings was to educate a criminal suspect of his inconsequential right to refuse to assist the government in establishing his guilt, perhaps suspects do not clearly and completely understand that right? This article will assert that, contrary to the criticism that Miranda was overly protective of the rights of criminal suspects, the warnings required by that decision are in fact not protective enough. This accounts for the reality that most criminal suspects waive their rights and facilitate their own convictions. More specifically, this article will assert that, from the outset of the warning and waiver requirement established by the Miranda decision, what is perhaps the most important warning has never been required: that silence in the face of an allegation is never incriminating. This “missing” Miranda warning is, in the opinion of the author, perhaps the most important warning a suspect confronted with custodial interrogation requires to meaningfully exercise the privilege against self-incrimination, and yet it is the one warning that has never been required. Without this warning, the suspect is left to fear the instinctual expectation that silence in the face of accusation will be inferred by the accuser as guilt. Without being informed of the constitutional prohibition against such inferential guilt, the suspect is left to choose between standing on the right to silence and “looking guilty,” or attempting to explain to the accuser why the accusation is erroneous. When considered from this perspective, it becomes easily understandable why a suspect would choose to enter into a dialogue with the interrogator, even knowing full well “anything said or done can be used against you in a court of law.” In short, unless the suspect understands that saying nothing cannot be used against him, the risk that what he does say may be used against him seems far less significant. This underinclusiveness is a necessary consequence of any rule of presumption, and does not in the abstract justify abandoning Miranda and reverting back to the case-by-case voluntariness test it effectively replaced. Acceptance of this consequence has been a central theme of all post-Miranda jurisprudence. However, tolerance is not synonymous with the conclusion that underinclusiveness is unavoidable. Instead, the recognition of underinclusiveness warrants consideration of whether it is genuinely inevitable and unavoidable, or whether it is the result of a defect in the method used to strike the balance Miranda sought to achieve? If the answer is the latter, then considering how Miranda should be adjusted is both logical and appropriate. Perhaps because Miranda has been under attack since its inception, this question has received virtually no consideration. What calibrations could Miranda’s presumptive rule undergo to mitigate some of its natural underinclusiveness? This article will address this question. First, it will review the purpose for the Miranda warning and waiver requirement.  Second, it will consider how the established warnings left criminal suspects vulnerable to the influence of an adverse inferential perception of guilt, resulting from silence in the face of allegation. Third, it will discuss the proclivity of criminal suspects to waive their Miranda rights. Fourth, it will discuss incongruity between the absence of a no adverse inference warning and the prohibitions of exploiting a suspect’s silence at trial. 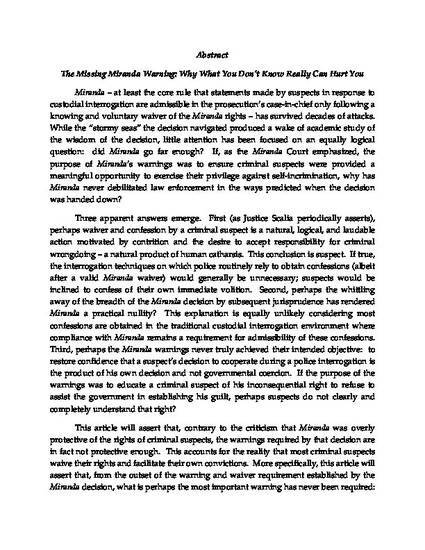 The article will then propose how adding this missing Miranda warning would more effectively align the original purposes of Miranda with the prophylactic actually used to protect the free exercise of the privilege against self-incrimination and, in so doing, create symmetry between the investigatory and trial phases of criminal prosecution.